The Army Tuition Assistance Program, better known as TA is available to any member of the Army, Army Reserve or National Guard that are currently on Active Duty. The program is designed to help servicemen and women further their education while protecting their country. The program can give you up to $4500 per fiscal year in funds (or $250 per semester hour) that can be used at qualified schools. All of the schools listed in our Featured Military School section are approved schools that offer TA funding to the Army. The first step is to find the school you want to attend or the program you wish to enroll in and request information from that school. You'll then be told to visit the Virtual Education Center for the Army at GoArmyEd. Once you complete all the info on the site you'll then want to request your AARTS official transcripts. You can do this by requesting the information online. All of this information is also available as well as additional help at your local military education office. 1. All requests are done through GoArmyEd in terms of the courses you are requesting to be paid by TA. 2. Nobody besides GoArmyEd can tell you if you qualify or not or if your tuition assistance is approved. The school will help you but you will be notified directly by GoArmyEd if your request is accepted or rejected. 3. It is important that you are responsible for 100% of all expenses if you fail your course. If you receive an F grade you will be notified to repay your Tuition Assistance. 4. Not all schools are equal. Many of the schools offering for example an Associate's Degree might range in tuition from $15,000 to over $30,000. Your TA will only cover $4500 per year. Any additional costs will need to be paid out of pocket. Don't be fooled into enrolling in a program without knowing you are responsible for paying what the DOD doesn't cover. Many schools will try to get you to enroll and take out the rest in student loans using the Federal Student Loan program. In our opinion there are too many good schools that will 100% cover your education without the need to take out a loan. The Army also has a LPR (Student Loan Repayment Program) which if you qualify could pay for up to $65,000 in student loans that were acquired prior to joining the Army. Additional programs are ACF (Army College Fund) which his knows as the MGIB® Kicker. This program is available to high school graduates who score more than 50 on the ASVAB test. Being in the Army you go through many tough phases in your career. Being on active duty requires a lot of mental and physical strength. You spend most of your career in the military away from your family members and loved ones. You need to be mentally and physically prepared for anything and everything in life. Are you prepared for the challenges that will face you once you leave the Military? Ideally, you should have the privilege to live a very comfortable and happy life once you retire from the Army. You have faced tons while in the military and problems will come up back in civilian life, especially due to lack of employment available.Today, many in the Army are turning to education to secure their success as a civilian. There are plenty of army education programs available for you and now is the perfect time to start. These education programs are available from many of the top schools and the online option has been proven to fit best with your active and busy lifestyle while in the Army. Because you are on active duty you can enroll in a school and take courses from anywhere in the world you are stationed. There are many that have enrolled in the last 3 years that are currently stationed in Iraq and Afghanistan serving their country while at the same time securing their own future once they have completed their duty. Remember, you have tuition assistance available to you and you might as well use it while you have a chance. Don’t make the mistake of spending four years in the military only to leave without the proper education. The US government encourages the army officers to enroll in school. The government takes all the necessary steps in order to encourage the army officers. The US government specially started with the TA program so that more army officers will be fully educated and further their military career. Weather you plan to end your career after your duty is over or continue in the military, we urge you to take advantage of these programs while the funding is available. One of the best recommended online army educational programs for the Army is to start with a general associates degree as you will already have transferable credits you can use after a year I the service. Check with your ESO officer today and learn more about your many possibilities. Most of the online certificate army educational programs can be completed in one year. Some of the programs can also be completed in less than one year. 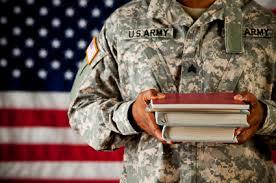 There are many universities, institutes and online schools that offer different types of army educational programs. All the study material is also provided by the online school to the student.